I've been busy this morning making these cards to share with you today. The first is my card for today's SCS color challenge. The challenge was to use Soft Sky, Black and Kraft, or you could substitute Bashful Blue and Creamy Caramel. I chose to use the substitution colors because I don't have any Kraft paper and I only have one sheet of Soft Sky left. 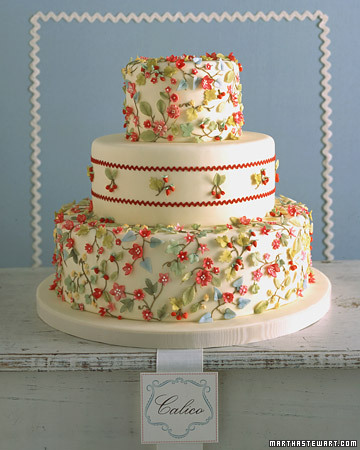 Beate's Inspiration piece this week is this picture of this beautiful cake from the Martha Stewart Website. I loved the delicacy of the flowers and the elegant colors of the blue, red and the green. My interpretation focused on the circles of the wedding cake which I stacked with Stamping Dimensionals to give the tiered look. I used Fiskar's border stamps to represent the wavy lines around the center of the cake. I used Prima flowers in the center of the card. The card is made with Certainly Celery, Bashful Blue, Wild Wasabi and Real Red. The background stamps I used were Fine Lace, Itty Bitty Backgrounds, and Basic Backgrounds . I must admit I am torn about whether or not to stock up on my "In Colors" before they disappear. Are you? I think I'm going to have to break down and get at least a package of Soft Sky and Groovy Guava...maybe River Rock too. Have you all picked out your "Gotta have 'em" sets from the retired list? Surprisingly I am only interested in about three of the sets on there. I would much rather wait and order lots of stuff from the new catalog in August. Ok, so that's all for me today. Have a fantastic day, and as always, thanks so much for visiting with me. Remember, I'm always happy to hear from any of you and always appreciate any comments that you leave. That is a gorgeous cake, LOL! Can you tell I'm hungry?!?! Great job with the cards also-- I love challenges- finding myself doing more and more of them!